It incorporates a precision wire-wound potentiometer as a shaft angle transducer, enabling wind direction sensed by the F20 fin to be accurately determined. The potentiometer has the lowest possible torque consistent with long life and reliability, the small gap at north being filled with an insulating material to ensure smooth operation over the full 360°. This windvane is Fixed Reference, that is to say that it must be aligned with north during installation and fixed in that position/orientation during operation. The standard F20 vane-arm (fin) assembly is attached using the unique Porton gravity fastener allowing good alignment and rapid attachment and release. A large alternative vane-arm (fin), type F20/LV is available where improved sensitivity is required. The high specification precision potentiometer used in this windvane has been extensively tested by Vector, both in the lab and in the field, and has been found to be the most robust and reliable of all the types they have examined. It is connected with 2-wires to each end of the track and one to the wiper enabling it's use in a variety of bridge and potentiometric measurement configurations. 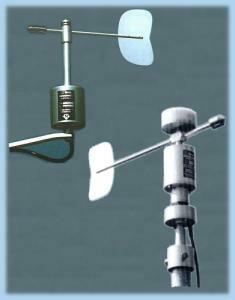 Accuracy: +/-3° in steady winds over 5m/s (6m/s /WR, 3.5m/s /LV), with +/-2° obtainable following calibration.